Within reach of the Federal Capital are a series of different Argentine attractions, many of which make enjoyable day trips and longer excursions from Buenos Aires. The peaceful riverside suburb known as El Tigre lies just a short distance to the north-east of Buenos Aires and has become something of a weekend riverside retreat for local portenos, with further attractions close by, within the Delta del Parana and on the Isla Martin Garcia. La Plata is a busy university town and called home by almost 250,000 people. Sited roughly 55 km / 34 miles to the south-east of Buenos Aires, La Plata has much to offer in the way of attractions, including the best science museum in the whole of Argentina, the acclaimed Museo de Ciencias Naturales. 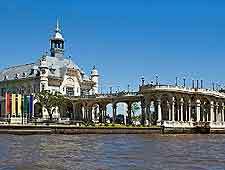 Further possible excursions include the tourist destinations of Lujan, Rosario, San Antonio de Areco and also San Pedro. Boat rides are one of the most popular attractions in the Delta del Parana area, taking passengers around narrow forested waterways and passing many stilt houses along the way, which have been raised high to avoid possible flooding and storm waters. Nearby El Tigre is famous for its port fruit market (Puerto de Frutos) and scenic Paseo Victoria. 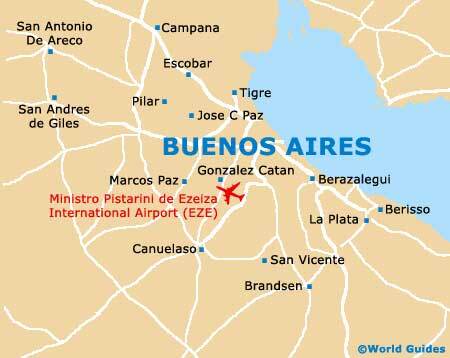 Sailing and boat is readily available here and El Tigre serves as a good place to depart for the Delta del Parana and also the Isla Martin Garcia, and is a 45-minute train journey from Buenos Aires Retiro railway station, which resides on the north-eastern side of the city. Capilla del Senor is located approximately 80 km / 50 miles to the north-west of Buenos Aires and so if perfect for those looking for a day trip away from the Argentine capital. Designated as the country's 'First National Historical Town', Capilla del Senor offers a number of different attractions, including rides onboard a restored steam train and a historic chapel dating back to middle of the 19th century. The Argentina island known as the Isla Martin Garcia is to the north of Buenos Aires and close to Uruguay's Rio de la Plata shoreline. With just a small population number around 150 people, the Isla Martin Garcia covers less than two square kilometres / one square mile and in the past was used to imprison a number of presidents of Argentina, such as Juan Domingo Peron. Often compared to Alcatraz Island in San Francisco, the Isla Martin Garcia resembles a large parkland / nature reserve and is filled wit noisy green parrots. The island rises some 27 metres / 89 feet above sea level and provides good lookout points across both the Parana River and the Uruguay River. La Plata was established in 1882 and was designed with diagonal streets, which form a rather elaborate and slightly confusing star shape when viewed from above. Many of the original buildings still standing are very European in flavour and the result of an international architectural competition at that time. La Plata's Gothic-style cathedral dates from 1885, although was not actually inaugurated until almost 50 years later. 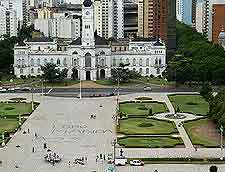 The Plaza Moreno is very central to life and surrounded by important landmarks, such as the 19th-century Palacio Municipal. The city of Lujan is almost 70 km / 43 miles to the west of Buenos Area and is famed for its spectacular neo-Gothic basilica, which dates from 1889 and was created to honour Argentina's patron stain, the Virgin of Lujan. Each year, over six million people come to Lujan to visit its basilica as a pilgrimage. Other very noteworthy attractions in Lujan include many recommend grill restaurants, and the Enrique Udaondo Museum, where you will discover exhibits showcasing various aspects of colonial life and antique vehicles, including the very first hydroplane to make a successful crossing between Europe and Argentina. The country's earliest steam locomotive, La Portena, is also on display within the Enrique Udaondo Museum. With a population now topping one million, Rosario is currently Argentina's third most populated city and the biggest within the Santa Fe province. Rosario is to be found around 300 km / 186 km to the north-west of central Buenos Aires and is a major shipping centre for this part of Argentina, as well as an important railroad terminal. 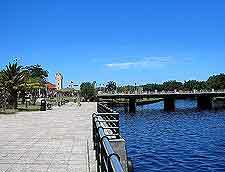 The main tourist attractions of Rosario tend to line the riverfront, where the best known as La Florida resides. Rosario is known for its outdoor sports and activities, with cycling, kayaking, horse rising, sailing and even skydiving all being readily available here. 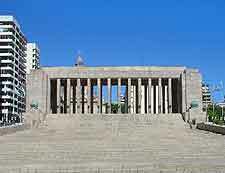 The Argentina Flag Memorial (Monumento a la Bandera) is a notable local site, as is the house where Argentine revolutionary and politician Che Guevara was born. San Antonio de Areco resides on the southerly side of the River Areco and just over 110 km / 68 miles to the west of the city of Buenos Aires. Ideal for a day trip of longer weekend excursion, San Antonio de Areco is a very serene Argentine town, founded in the early part of the 18th century. Alsina Street is where much of the action takes place in San Antonio de Areco and is lined with shopping attractions, where locally handicrafts of the highest quality are sold. Serving as the town's zoo, the Parque de Flora y Fauna Autoctona Carlos Mesti is fairly modest, while the Parque Criollo y Museo Gauchesco Ricardo Guiraldes is a much-visited attraction in San Antonio de Areco, along with the Centro Cultural Usina Vieja. The San Pedro stands within the Buenos Aires Province and is 170 km / 105 miles the north-west of the city itself, being located on the westerly side of the Parana River. Many tourists regularly come here to take full advantage of the excellent fishing opportunities on offer in San Pedro, or to visit the crowd-pulling Country Music Festival each September, which has become one of Argentina's biggest and is just over a week long.